Have you heard of soil blockers? 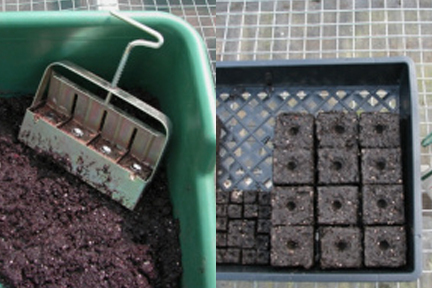 It's a way to make blocks of soil to start seedlings. If you garden on a large scale and find that making a lot of paper pots is too time consuming, you may want to consider soil blockers. I'm sure you're wondering about the roots at this point. When they grow to the edge of the block, they stop because of the air. When they're planted in the ground, they resume growth. Here's a video clip to show you these being made in action. Nice. However, I'm finding that a "recipe" for the soil is necessary for these blocks to hold together well, especially when watering. Or so they say. I'm going to be experimenting with different soils and seed starter to see for myself, but so far, I've had to special order several soil amendments such as blood meal, colloidal (rock) phosphate, and green sand. And since I live where the soil is alkaline, I had to hunt down some lime. (If you live where soils are acidic, every nursery probably carries lime). So much for self-sufficiency. But perhaps I can make something work. I'm trying not to be discouraged here. The concept is great, but the soil is the issue. And might I mention these are not cheap? My purpose for investing in one was so that I could start seedlings for plants to resell. But if you're interested in a homemade model, there are some plans out on the world wide web. Just google homemade soil blockers and you'll get some hits. Have you used soil blockers? Please share your experience and any soils you found that work well with these! I'd love a simpler solution! 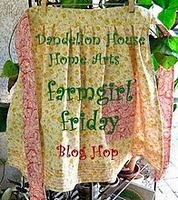 This post is linked to Farm Girl Friday and Farm Friend Friday. Winner: Homemade Living - The Series! Give Away: Homemade Living - The Series!